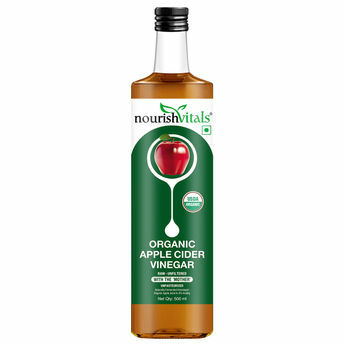 Nourish Vitals apple cider vinegar is made from the juice of the finest quality of select apples grown in the orchard of the pristine hills of the Himalayas. Nourish Vitals apple cider vinegar is 100 percent natural, raw unfiltered and non pasteurised retaining the natural residue and goodness as a mother of vinegars with its richness in natural components. It has no preservatives, no colors, no artificial flavours and is unfiltered with mother vinegar. For centuries, vinegar has been used for various household and cooking purposes salad dressings, marinades, vinaigrettes, food preservatives and chutneys, as a flavouring agent and for various health benefits like weight management, supports a healthy immune system, improves digestion and many more. Apart from these uses, apple cider vinegar also has numerous other non health related uses like hair conditioning, dental care, as a cleaning agent and it is especially useful for people who like to keep things natural and chemical free. Nourish Vitals apple cider vinegar is pure and has the goodness of mother of vinegar, that lends it a cloudy look, but is an affirmation of high quality unprocessed vinegar. About the Brand: Nourish Vitals is committed to being a trustworthy and innovative global leader by providing genuine True Wellness products. A popular healthcare and wellness brand known for offering organic, healthy products, the brand uses advanced processing methods ensuring that ingredients retain their maximum level of potency giving you highest quality, most effective, pure and natural products at the best prices. The premium range of high quality products are 100% natural and free of preservatives, thus working well for overall health and fitness. Explore the entire range of Super Food available on Nykaa. Shop more Nourish Vitals products here.You can browse through the complete world of Nourish Vitals Super Food .